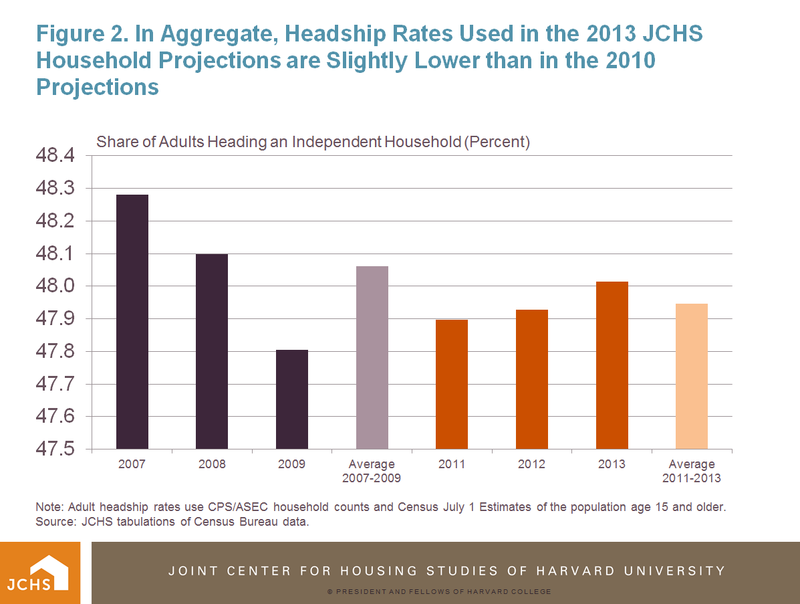 Today, the Joint Center for Housing Studies posted its latest household projections. These new projections incorporate several updates to data that were made since our last projections in 2010. 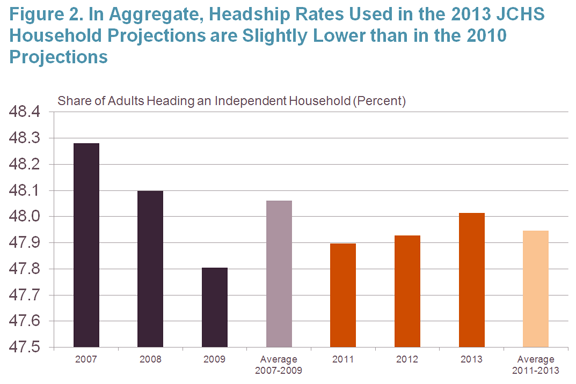 The 2013 projections use the Census Bureau 2012 Population Projections (released in late 2012 and early 2013), and also use more recent data to derive headship rates (ratios of households per person), specifically using data from the 2011-2013 Current Population Estimates and Current Population Survey March Supplements. Aside from the new data, the JCHS projection methodology remains largely unchanged from that used to create the 2010 series. The most notable change is that unlike in 2010 we do not make any adjustment to the Census Bureau’s population projections, as our concerns about what seemed to be overly high estimates of future immigration levels have now been addressed in the latest projections from Census. 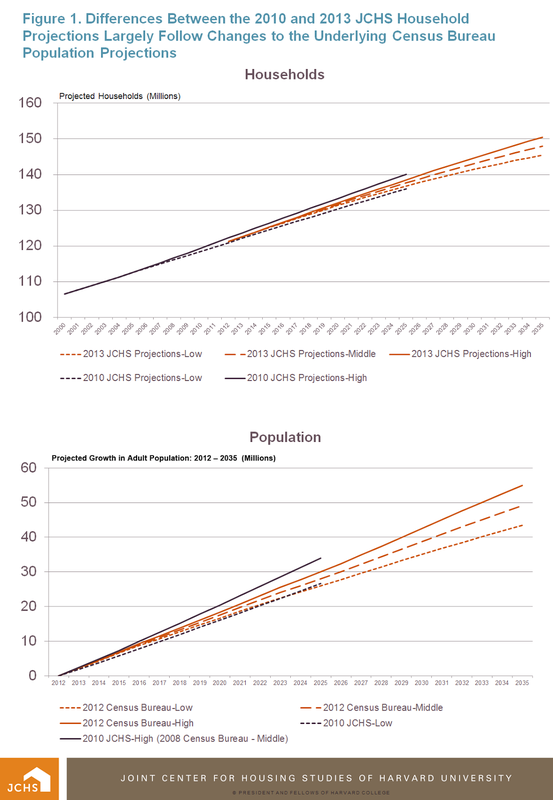 Since we are using the 2012 Census population projections as published, the 2013 JCHS household projections now contain high, middle, and low series, whereas the 2010 projections only had a high and a low series. The projections are also carried out an additional ten years, and so now extend to 2035. 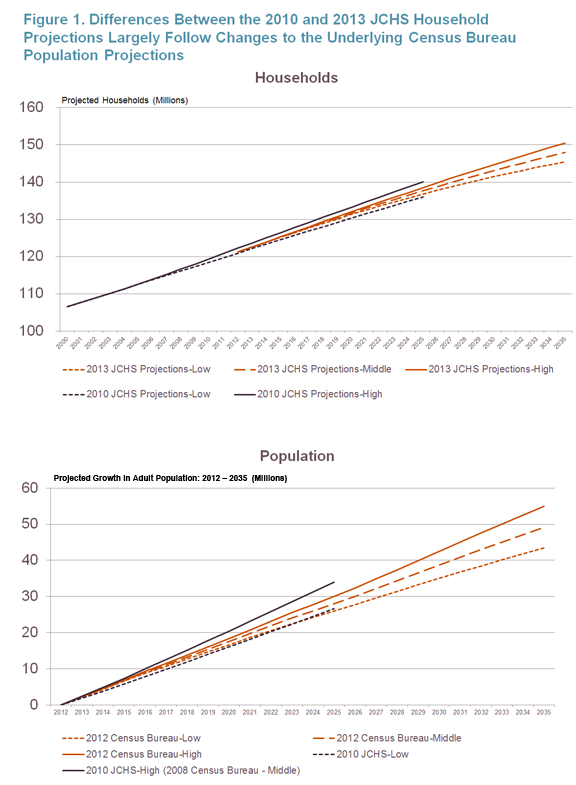 Sources: 2008 and 2012 Census Bureau Population Projections and 2010 JCHS Household Projections. Note: Adult headship rates use CPS/ASEC household counts and Census July 1 Estimates of the population age 15 and older. Source: JCHS tabulations of Census Bureau data. 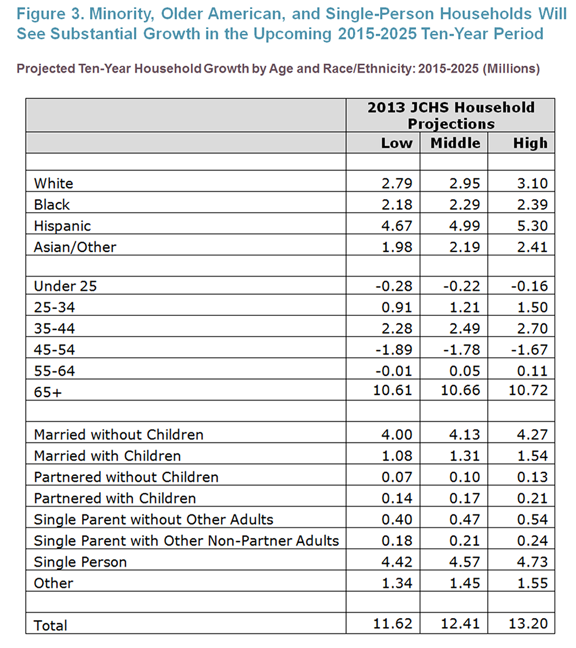 Like the 2010 projections, our 2013 household projections also anticipate substantial growth in minority, senior, and single-person households in the coming decades (Figure 3). In the 2015-2025 period for instance, minorities are projected to account for just over 76 percent of all household growth in each of the low-, middle-, and high- projections, with Hispanics alone accounting for 40 percent of total household growth. Additionally, growth in the number of households age 65 or older during this period is also expected to be 91 percent of the net change in households under the low projection and 81 percent in the high projection. As a result of the growth in senior households, single-person (4.4-4.7 million) and married-without-children households (4.0-4.3 million), two of the largest groups that comprise senior households, will together comprise nearly three quarters of all household growth in 2015-2025, but the number of married with children households will also see some growth as millennials age. Source: 2013 JCHS Household Projections. The report also includes a simple homeowner and renter projection scenario. Under a steady-state scenario of constant homeownership rates by age, race, and household type, this analysis offers one look at how demographic changes in the composition of households may influence future homeownership rates. 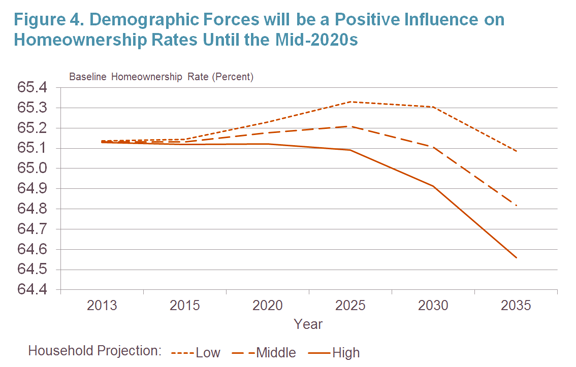 In this scenario, changing demographics are expected to be a positive influence on the overall homeownership rate through about 2025 (Figure 4). After that time, the upward influence of the aging of the population gives way to greater downward pressure from young adult and minority household growth. 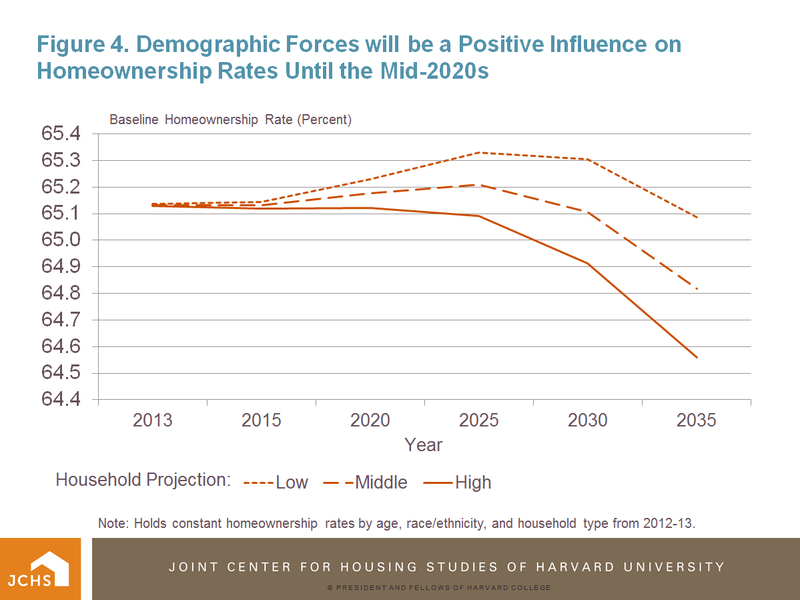 Figure 4 shows how downward pressure on homeownership rates is steepest in the high projections which, unlike the middle- and low-projections, expects no demographically driven growth in homeownership rates through 2025. Note: Homeownership rates by age, race/ethnicity, and household-type are held constant. 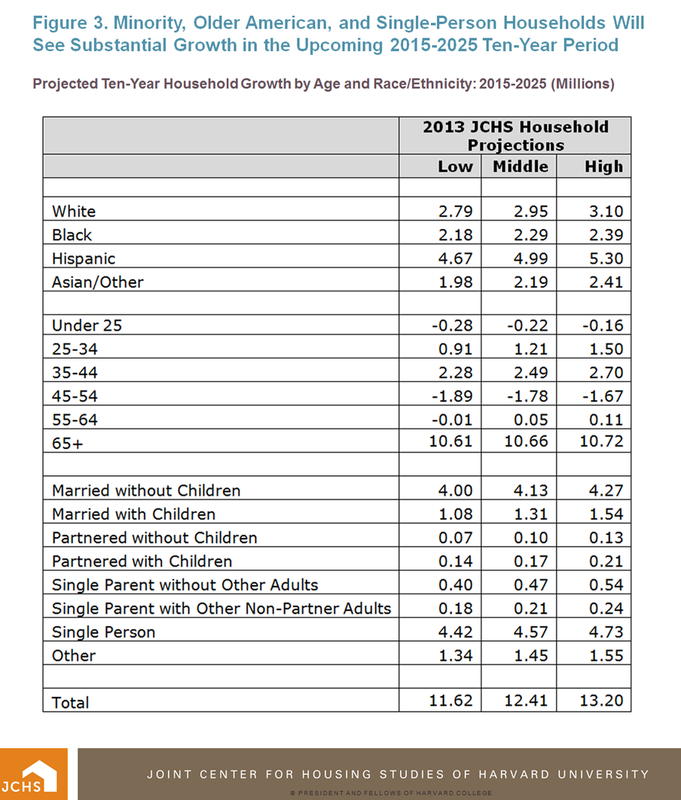 Source: Joint Center for Housing Studies tabulations of 2013 JCHS Household Projections. Users of these estimates are cautioned that that they should be considered baseline projections and not a growth forecast. Actual household growth could deviate dramatically over short periods of time, as the projections reflect long-run, demographically driven trends and do not allow for any adjustments either upward or downward in response to changing economic conditions or cyclical factors. Indeed, favorable economic conditions could increase headship rates above levels assumed in the projection and increase household growth, while a variety of factors could weigh down economic opportunities and result in lower household formation rates that depress future household growth.